JISC Digitisation in the UK report, 2005. Even though the quote above is from a research report produced by JISC over nine years ago, lack of funding is still by far the most common reason cited by the archives, libraries, and museums that we work with for them not being able to digitise all of the collections they would like. Thankfully though, as the importance of digitisation of cultural heritage materials has become more widely acknowledged, financial support for digitisation initiatives is growing. The TownsWeb Archiving Digitisation Grant fund is now open and accepting applications for UK based heritage digitisation projects from archives, public and private libraries, museums, and galleries. The 2017 TWA Digitisation Grant opens to applications on 30th May. The Joseph Rowntree Charitable Trust provides funding to support cultural heritage digitisation projects, provided that they support or relate to one of the organisations priority areas (follow link below to review these). The Trust funds charitable organisations based in the UK to undertake work at a national level. This means work that seeks to make positive change across the UK as a whole, or across one or more of its member countries – England, Scotland, Wales or Northern Ireland. The Heritage Lottery Fund (HLF) uses revenue generated from The National Lottery to provide funding for a variety of UK heritage projects, including digitisation and digital archiving projects. HLF funding is available through several Grant Programmes, including the Sharing Heritage programme for smaller local studies and community projects; Our Heritage scheme for larger scale regional and national initiatives; and currently the First World War: then and now programme which aims to fund projects that contribute to commemorating the World War One Centenary. In addition, with regard to heritage digitisation projects, it is a condition of HLF funding that the digitised archives are made available for public access – ordinarily this involves the digital archives being published online. The Rothschild Foundation’s overall aim is to ensure that Jewish heritage material is protected, conserved and accessible to all. They offer a range of grants for charitable organisations concerned with heritage preservation including digitisation projects. The Foundation’s Archives and Libraries Grant takes applications for digitisation projects and ask that the purpose of digitisation is clearly explained in the initial application for example; is it for preservation purposes, increased access etc. Alternatively for Museums wishing to digitise and host collections online – there is the Museums Grant. To be considered, organisations should be able to demonstrate digitisation knowledge/experience and a readiness to make their digitised collections available through wider platforms, like Europeana, is desirable. The Charles Hayward Foundation Small Grant programme for heritage and conservation projects provides funding for charities looking to undertake digitisation projects, but predominantly only funds digitisation if it is one part of a wider preservation project. The NMCT is focused primarily on the conservation of rare, fragile and historically significant manuscripts in the UK. However, NMCT does offer grants to digitise manuscripts, where the digitisation is part of a broader conservation project. The Esmee Fairbairn Collections Fund is run in partnership with the Museums Association and “focuses on supporting work on museum collections which is outside the scope of an organisation’s core resources”. Projects that are eligible to apply include research into collections, conservation, collections review and initiatives to develop the use of collections. The Fund has supported digitisation projects in the past, including lantern slide and photograph collections. The Golden Bottle Trust (GBT) was established by the C. Hoare & Co. private bank in 1985. It is funded by excess profit from the bank and donates money to a diverse range of UK-based causes.Although broad in its scope, in 2011-12 GBT donated £101,000 of funding to Arts, Culture, Heritage and Science organisations in the UK. The Pilgrim Trust is working to preserving the UKs heritage in many forms, but specifically including artefacts, books, and manuscripts. 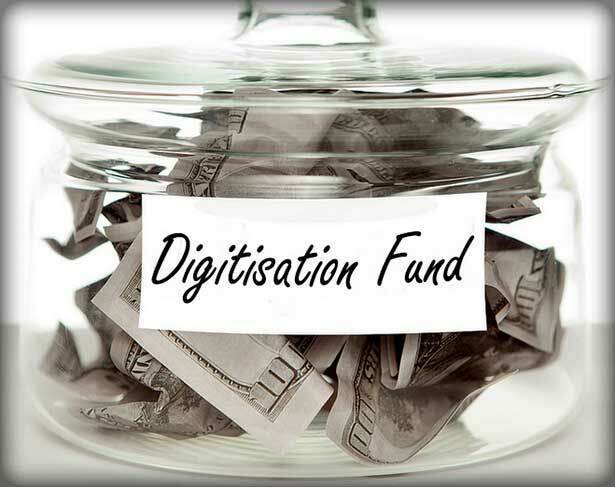 The Trust considers all applications for funding digitisation projects, but does give funding priority to projects it considers to be of national importance. The Marc Fitch Fund offers special project grants for the “cataloguing, scanning, transcription and study of significant primary resources”, predominantly focusing on materials that originate from the pre-1945 era. The Fund particularly supports local and national historical societies looking to digitise their journal backlists and publish them online. The Fund provides support to projects within the British Isles only, and as conditions of funding a project must demonstrate that a project will involve original research and the digitised materials must be made available to the public after the project has ended. The Wellcome Trust offers funding for the digitisation of UK based archive and library collections through its Research Resources Award grant scheme. The grant fund supports the digitisation of collections relating to the history of medicine and health, the medical humanities or social sciences. The grant scheme is open to organisations in the UK, however as a condition of funding digital resources must be made available to the Wellcome Trust once the project has ended. In addition the Wellcome Trust Research Resources award does not provide support to projects that include plans for revenue to be generated from the digitised content. The Clore Duffield Foundation is a funding organisation based in London, which provides support to UK charities predominantly in the museums and cultural heritage sectors.The programme can provide project or programme funding, or match Lottery funding already achieved, but organisations applying must be registered charities in order to be considered. The Mercers Company offers grants for digitising archive collections under its Heritage and Arts programme. It bases decisions on whether to provide funding on the content, significance and context of the archive. Museums Galleries Scotland (MSG) is the National Body for the development of museums and galleries in Scotland, providing support to the sector via strategic investment, advocacy, and skills development. In line with its aim of maximising “the potential of Scotland’s collections and culture” MSG is encouraging museums and galleries in Scotland to digitise their collections and make them accessible as digital archives online. As part of this it is offering funding for digitisation projects and for the purchase of CMS systems to share digitised collections online. The British Academy for the Humanities and Social Sciences pledge around £25 million in grants every year to a wide variety of projects. Although the grants are primarily post – doctoral research based, projects involving the digitisation of humanities and social science based resources have been funded through the Academy’s BA/Leverhulme Small Research Grants Programme. The Wolfson Foundation has a long history of supporting the arts and humanities and recognises the importance of the cultural sector; having recently donated £225,000 to fund cataloguing in support of The National Archives’ Archives Revealed programme. The Foundation offers specific funding streams for both the Performing Arts and Museums & Galleries, and will consider funding cultural heritage digitisation projects depending on the significance and importance of the collection(s) being proposed. The Arts & Humanities Research Council (AHRC) offers a number of funding streams that will support the creation of digital resources, with a variety of projects funded, including their Standard Research Grants and Follow on funding scheme. These grants aim to encourage interaction and build knowledge between arts and humanities research and user communities, such as business and commercial, voluntary groups and the general public. This interaction can come in different forms, including the creation of online digitised archives like the Jane Austen’s Fiction Manuscript project. All UK Higher Education Institutions that receive funding from a UK Higher Education funding body are eligible to apply and other organisations can apply to AHRC in collaboration with a UK university or AHRC recognised Independent Research Organisation. An independent trust distributing grants to UK registered charities, The Foyle Foundation operates two grant schemes open to heritage digitisation projects. The Main Grants Scheme supports charities whose work covers Arts and Learning, with priority given to sustainable projects which offer a service to the general public. And the Small Grants Scheme supporting smaller charities in all fields providing their annual turnover does not exceed £100,000. Of key concern to the Foyle Foundation is sustainability, public benefit and accessibility. Therefore heritage preservation projects with the intent to open access to collections digitally are a key demographic of the foundation. Applications are accepted all year around and a realistic response time is 4-6 months. Only Applications from UK registered charities will be considered, individuals and non-charitable organisations are not eligible for Foyle Foundation Grants. Is there a Funder we’ve missed? We hope you find this resource useful if you are looking to find funding for a digitisation project. Is there a fund or trust missing from our list that helped fund a digitisation project for your archive or library? Let us know by emailing [email protected] or tweeting @townsweb and we will add it here. We are also always happy to put information professionals that are planning to apply for funding in touch with our clients that have been through the funding application process. So if you are planning to apply for funding from one of the bodies above and would like to gain insight from someone who’s been successful just contact us. Find this article useful? You might also like our “Best Practice tips for Planning a Digitisation Project” post.